Murrayfield Racers are through to the Scottish Cup Final, tonight’s 5-3 semi-final second leg win at Kirkcaldy Kestrels resulting in a big 11-3 aggregate victory for the Murrayfield men following their 6-0 demolition job in the first leg at Murrayfield last month. After a goalless first period Racers led 3-1 after 40 minutes, with goals from Michael Ireland, Callum Boyd and 16-year-old defenceman Ethan Reid. Kestrels made a game of it in the final period, their goals coming from Garry Simpson, Graeme Allan and Allan Anderson. 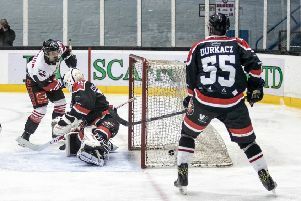 However, Racers, who remain undefeated in all this season’s Scottish National League sanctioned competitions, always kept their noses in front on the night through goals from Joel Gautschi and a second for Ireland. 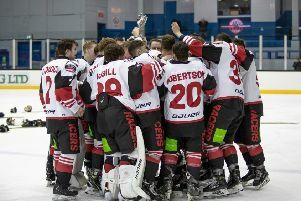 Having already won the SNL league title, Racers, who now play either Dundee Comets or Aberdeen Lynx in the final to be held at Dundee Ice Arena on May 11, remain on course for a quadruple-winning season, with their play-off campaign getting underway on Sunday at Murrayfield against Solway Stingrays, and a Stuart Robertson Cup Final to be played over two legs against North Ayrshire Wild next month.